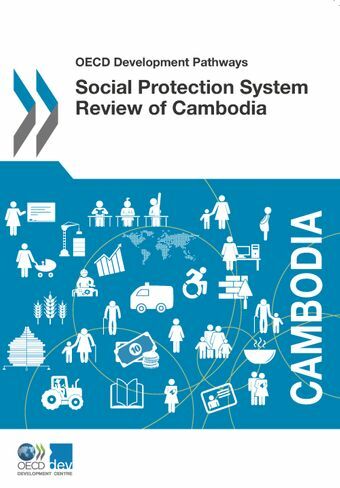 In 2017, the Royal Government of Cambodia published a new Social Protection Policy Framework (SPPF), providing an ambitious vision for a social protection system in which a comprehensive set of policies and institutions operate in sync with each other to sustainably reduce poverty and vulnerability.The Social Protection System Review of Cambodia prompts and answers a series of questions that are crucial for the implementation ofthe framework : How will emerging trends affect the needs for social protection, now and into the future? To what extent are Cambodia’s social protection instruments able – or likely – to address current and future livelihood challenges? How does fiscal policy affect social protection objectives? This review provides a contribution to the ongoing policy dialogue on social protection, sustainable growth and poverty reduction. It includes four chapters. Chapter 1 is a forward-looking assessment of Cambodia’s social protection needs. Chapter 2 maps the social protection sector and examines its adequacy. An investigation of the distributive impact of social protection and tax policy is undertaken in Chapter 3. The last chapter concludes with recommendations for policy strategies that could support the establishment of an inclusive social protection system in Cambodia, as envisaged by the SPPF.